The ALA South Florida Chapter was the second chapter to become a member of the National Association of Legal Administrators in 1972. Membership will open doors to resources, opportunities and friendships that will greatly benefit you and your firm. Learn more about South Florida Chapter membership.  Highlight your company, products, promotions and much more.  Gain access to both monthly luncheons (Miami and Broward) at member pricing.  Get discounted rates on newsletter ads, sponsorship opportunities and exclusive ALASOFLA events. Disclaimer: The South Florida Chapter, Association of Legal Administrators is a separate legal entity from the Association of Legal Administrators (ALA). ALA licenses the use of its name, mark, logos and other protected properties to chapters which are in good standing. 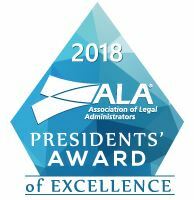 ALA disclaims all liability or responsibility whatsoever for the actions, representations and liabilities of the South Florida Chapter, Association of Legal Administrators, specifically including those of any nature whatsoever arising from or out of the content or other features related to the South Florida Chapter, Association of Legal Administrators web site. In no event shall ALA be deemed the guarantor of the South Florida Chapter, Association of Legal Administrators.